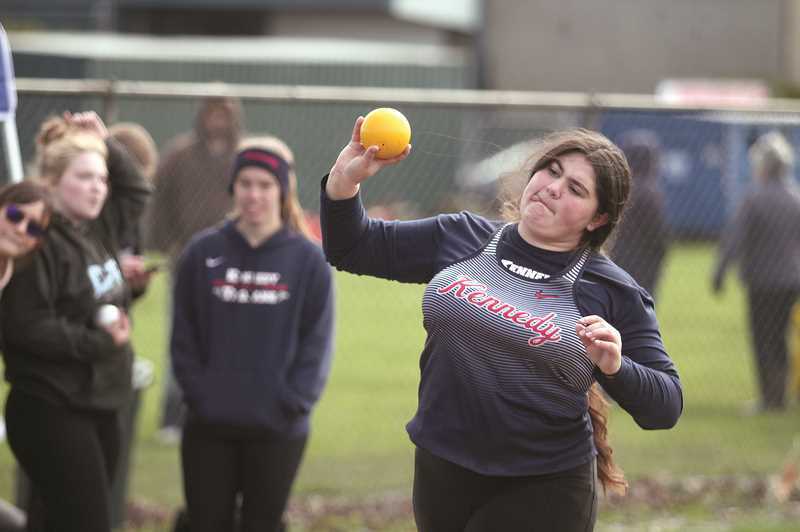 Although the North Marion track and field season technically began in March, last weekend's Husky Invitational felt much more official as members of the school's track and field program welcomed a dozen teams to compete in the intermittent rain and sun. Not only was it the first action for the Huskies in more than two weeks and the first home meet of the season, it was also an opportunity for North Marion to showcase the track and field in full use for the first time since the school's fall renovations to the facilities. "It's awesome to see all the schools come out," North Marion head coach Ryan Sederstrom said. "Have North Marion share the pride and the work and the community support that made the track happen." It was also another opportunity for sophomore javelin thrower Tyler Manning to showcase his skills, as he continues to make a bid as one of the top 4A throwers in the state this year. Manning upped his school record in the event, measuring a personal-best mark of 163-01 on Saturday to take first place and put himself among the top five javelin throws in the state this year in 4A. 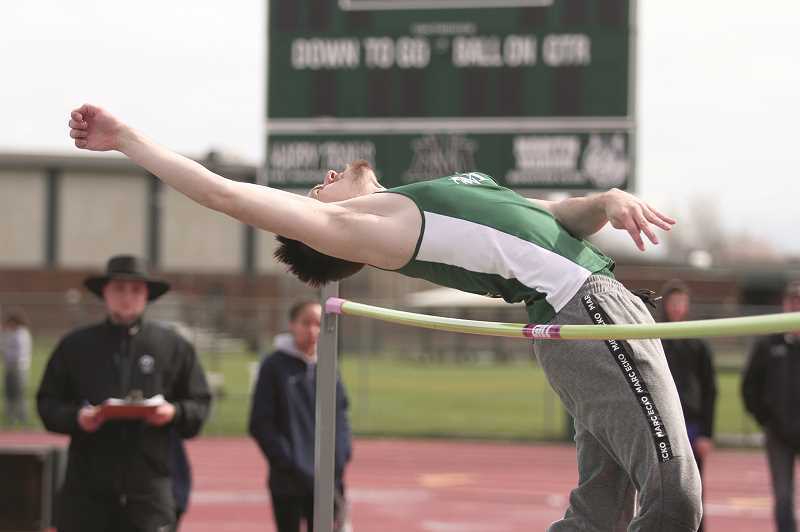 It's been a mercurial rise for Manning this season after a promising freshman year in which he opened the season at 114-02 and closed it at districts with a then-PR throw of 135-11. Despite the success, Sederstrom said Manning wasn't particularly interested in track at the time, but his attitude changed over the summer and he came into fall football season dedicated to improving himself overall as an athlete and individually in the event. "That's when his effort totally changed," Sederstrom said. "Coming out this year, he's the first in every workout and just eager to get out and throw. Tyler's been putting the work in and his mind set is just so positive." Manning broke his PR in his first meet of the season, throwing 145-02 at the Huskies' Time Trials on March 13. He upped that mark to 150-05 in Tualatin on March 21, breaking the former school record of 149-06 set by Marc Gillette in 2006. And on Saturday, his mark led the field by nearly 10 feet. He was the lone North Marion athlete to place first among both the boys and girls, but the Huskies feature a number of strong athletes this season. Senior Jarrett Adair is seeking a return to the state championship meet after qualifying in the 110-meter hurdles last year and placing 12th overall at state. He placed ninth in the event on Saturday with a time of 19.49, and added an eighth-place finish in the 300 hurdles (51.04), a 10th-place finish in the high jump (5-00) and was seventh in the triple jump (36-01). Sophomore Bryce Anderson took second in the 200 with a time of 25.72, while freshman Matthew Petrjanos added a fifth-place finish in the 400 (56.56). After leading the cross country team in the fall, Petrjanos is expected to give the Huskies a solid presence in both the mid-distance events, as well as the long jump, where he finished sixth on Saturday with a PR of 17-05.5. Junior teammate Isaac Santiago gives the Huskies another strong mid-distance competitor, and he finished just behind Petrjanos in the 400 at 56.87 and added a ninth-place finish in the 800 at 2:18.98 — both times were personal records for Santiago. The girls team was without its leading athlete on Saturday, with senior Mar Verastegui gone for spring break. Sederstrom expects another big season from the team's top jumper, who has been to the state championships in both the triple jump and long jump in her high school career and opened the 2019 season by setting a new PR of 16-09.75 in the long jump. "She's going to get back up this week and build on that," Sederstrom said. "She's only three inches away from the long jump school record." Junior newcomer Lilianna Santos was a bright spot for the Huskies on Saturday, leading the team in the 100 (14.86, 8th), the 200 (31.78, 9th) and the 400 (1:11.86, 8th). Sophomore Danielle Christenson added a ninth-place finish in the 800 with a season-best time of 2:46.69. 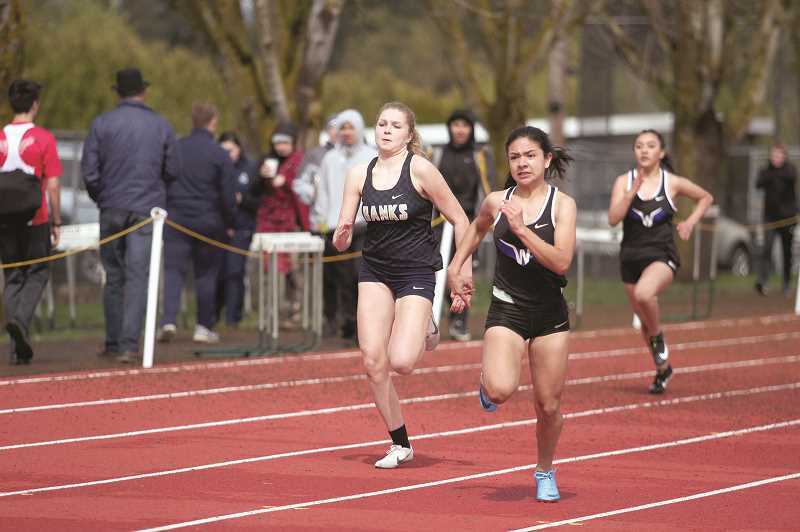 Among the teams present at the Husky Invitational were the nearby Woodburn Bulldogs, who have taken to North Marion's track and field facilities as a second home while Woodburn High School does their own renovations this spring. The Bulldogs are in the process of installing a new artificial turf field, and due to a tight construction window, were forced to commit to the work over the spring season, leaving the Woodburn track and field program without a place to practice and compete this year. Enter North Marion, which sits just a few miles down Boones Ferry Road, and was happy to partner with the Woodburn this season to share facilities. "They come up and use the facilities and leave them in better condition than when they left," Sederstrom said. "With some schools not having track, I'm just thankful North Marion has the facilities that I can help offer that instead of asking for that." The Bulldogs were making track and field debut on Saturday, and were led by a first-place finish in the high jump by senior Tyson Doman, who broke his previous PR by six inches with a height of 6-00._The boys team also saw a pair of strong performances in the throwing events, where senior Efren Montes took fourth in the discus with a PR of 123-09, and junior Christian Kurka added a third-place finish in the shot put with a mark of 39-04. On the track, junior Riley Menezes placed third in the 400 with a time of 54.57. For the girls, sophomore Yahaira Rodriguez came out of the gates blazing with a second-place time of 13.86 in the 100 to lead the way and a fourth-place time of 18.72 in the 100-hurdles. Freshman Myranda Marquez added a pair of top-five finishes in the distance events, placing third in the 1,500 with a time of 5:33.33 and fifth in the 800 at 2:42.74. The Kennedy girls finished atop the team standings at the Husky Invitational, leading the field with 123 points. Senior Hallie Sprauer and junior Sophia Rodriguez finished first and second in the triple jump with marks of 32-10 and 32-00.50, respectively. Sprauer also took first in the high jump with a height of 5-03. Fellow senior Caitlyn Kleinschmit added a first-place finish in the javelin with a PR-throw of 111-02, while Lilly English placed sixth in the shot put (30-01) and third in the discus (94-05). Senior Caitlyn Perez placed second in both the 100- and 300-hurdles with times of 18.25 and 55.58, respectively.